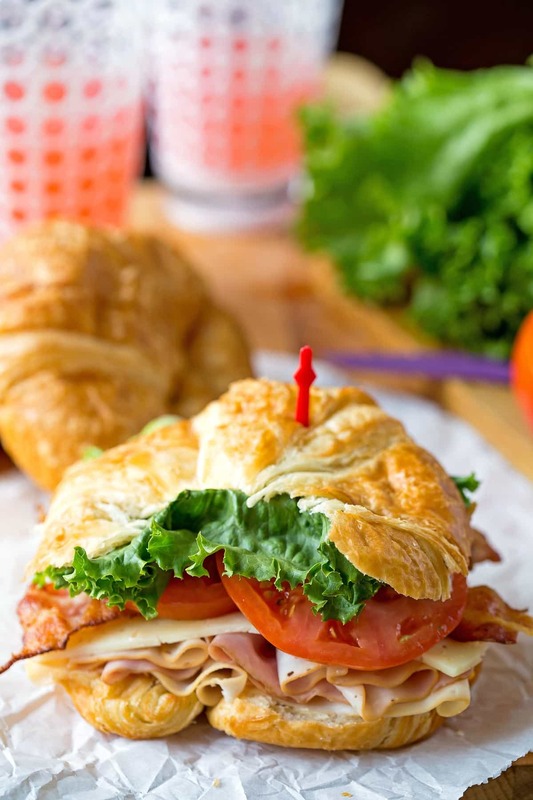 California Club Croissant Sandwich recipe is an easy lunch or dinner croissant sandwich recipe with 2 types of cheese and 3 kinds of lunch meat in one flavorful sandwich! Summer is in full swing here! We’re facing a crazy heat wave, which, when you live in Arizona, is saying something! And the last thing that I feel like doing when it’s 120 out is cooking anything on the hot stove. In an effort to keep the temps down in our house, we do a lot of grilling and eat a lot of no-cook or no-bake foods during the summer. One of my family’s favorite no cook meals is sandwiches. Everyone likes them because they can choose what goes into their sandwich and make it just the way they want. My older daughter’s favorite thing to do is to have a picnic with our sandwiches. Since it’s so nice in the winter, spring, and fall here, we have our picnics outside during those seasons. Summer means grilling outside but picnics indoors. We just toss a blanket on the floor, and we’re ready to go! One of the awesome things about sandwiches is how easy they are to make. Since we make a lot of sandwiches and grill a lot of burgers, we always keep basics like sliced cheese on hand. Since it’s already sliced, it makes prep that much easier, and there are a ton of varieties that can be used in any number of sandwiches. 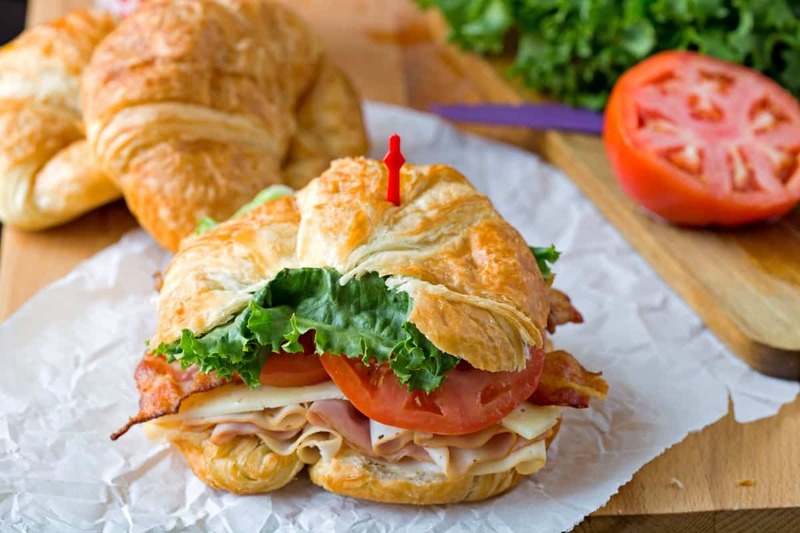 These California Club Croissant Sandwiches have two types cheese – Baby Swiss and Sharp Cheddar, along with three types of lunch meat, bacon, avocado, lettuce, and tomato for one flavor-packed sandwich. They’re perfect picnic sandwiches! These croissant sandwiches make a really easy lunch or dinner. Just stack and go! 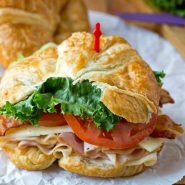 If you’ve tried this California club croissant sandwich recipe, don’t forget to rate the recipe and leave me a comment below. I love to hear from people who’ve made my recipes! You can SUBSCRIBE to receive my latest recipe newsletters or FOLLOW ME on FACEBOOK, INSTAGRAM and PINTEREST for even more delicious food. 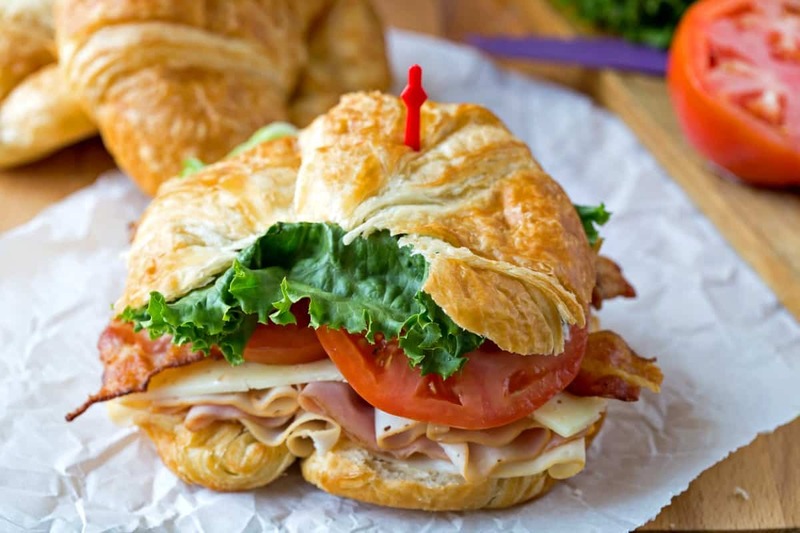 Layer one slice Sargento® Sharp Cheddar Sliced Cheese on each croissant. Top with layers of chicken, ham, and turkey. 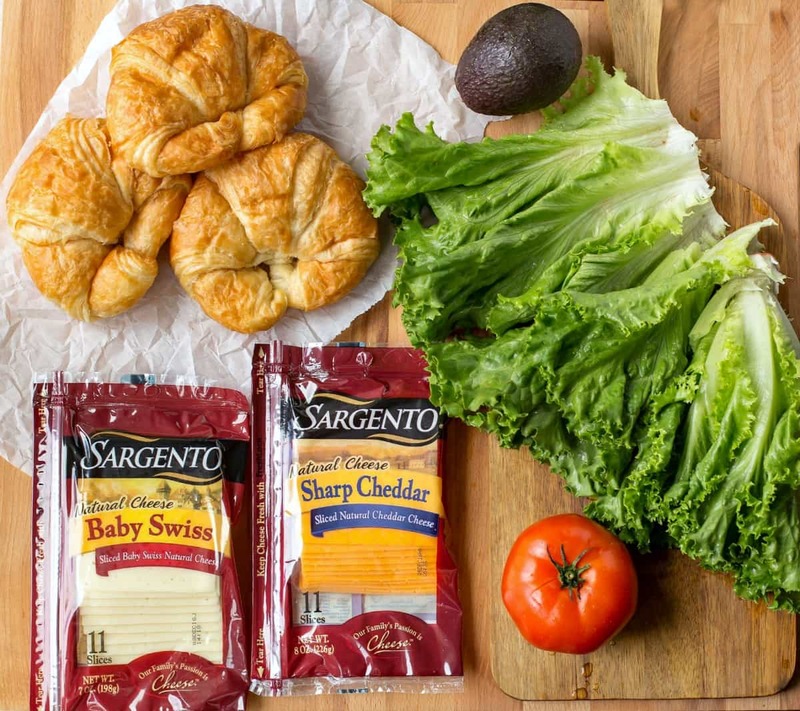 Add one slice Sargento® Baby Swiss Sliced Cheese over meat. Top with each sandwich with bacon, 1/4 tomato slices, 1/4 avocado slices, and a piece of lettuce. Spread top of croissant with mayo and mustard. Place top piece croissant over lettuce. ymmm! I have a soft spot for a perfect croissant! Especially for breakfast sandwiches. We recently discovered a bakery near us call the Paris Baguette. Highly recommend checking them out if one is near you:) I was in pastry heaven.